Written by admin1957 on April 12th, 2012 April 12th, 2012 . Choosing the top House Painting Contractor for the exterior or interior of your home may seem to be a tough task but taking intelligent steps will insure that you are victorious in this endeavor. An important project like painting the outer surface of your house may appear simple initially but once you think about the equipment and tools that are required for this type of project including experience, you might well think about hiring a professionally skilled painting contractor. In this post we desire to furnish you tips on how to find the best house painting contractor within your area to support the success of your upcoming painting project. Finding a properly qualified house painting contractor within your community that has the experience of managing your painting and renewal needs is not a tough job with a little understanding. Looking to locate the best home painting contractor from all the ads in yellow book can be confusing and even hard without discussing your job with someone face to face. Recommendations and input from loved ones, neighbors or other associates that have had a excellent prior experience with a house painting contractor is a wonderful way to discovering a super company for your house painting requirements. A good house painting contractor should possess a record of happy clients that they will give you on paper or present online and is a good resource for you to know about. Look at the painter’s web site for “before and after” images as well as testimonials to check what people have experienced. While it is true that some of the information may be false, it should be simple to contact some of the referrences. We also recommend that look for comments from local search engines results that are mainly available in the higher section of the results listings such as directories. Be sure to include the community of where you are located in, to investigate local search results and comments. Once in a while you may observe a couple low reviews but do not let that stop you as they are working with the general public. It just ought to not be the norm to include a lot of negative comments which is a bad sign. Make sure to view the qualifications and documents (insurance & licenses) of your painting contractor to make certain they are the right company for your needs. needed for finishing the job. Ask them whether they have a time guarantee for completion. You may need your house painting job to be completed at a certain time so making for sure that the painting contractor can complete the project on time. Ask them about the staff that the house painting contractor plans to employ, as well as the expense of all supplies that are needed for your project. An experienced expert house painting contractor should be delighted to assist you understand all the project steps, answer all of your questions and even offer several quality ideas in support of your house paint project. High-quality business practices and ethics are critical to a great contractor service. The paint contractor should communicate their clean up proceedures when the project has been accomplished. After all, we are looking for the finest paint contractor in the Denver Colorado metro area. 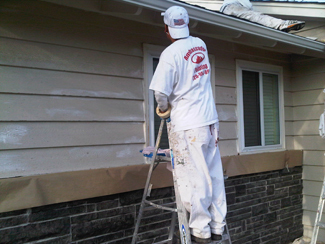 Ambassador Painting takes pride in being the Best House Painting Contractor in the Denver Colorado metro area. If you are in the Denver Colorado metro area we will be happy to provide you a free estimate of your next house painting project for either interior or exterior. We will be honored to be your house painting contractor. Make sure to visit our website at ttp://AmbassadorPainting.Com to request a free estimate or give Wanda a call today at (720) 984-0918.